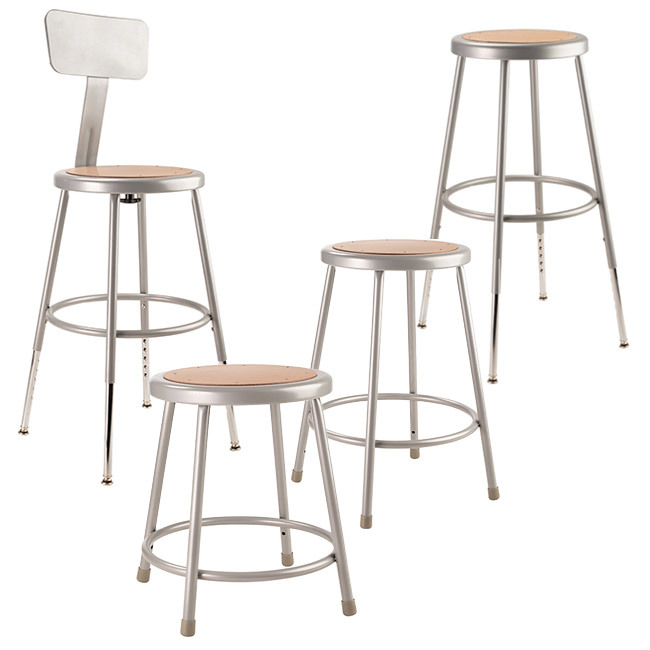 These Heavy Duty Steel Stools are made of 7/8" o.d., 18 gauge steel tubing in 3 fixed and 3 adjustable height sizes with an optional backrest. The seat is a full 14" diameter with an 11 1/2" diameter masonite board recessed into the seatpan and will not chip or crack. 5/8" o.d. Footrings are welded to each leg, with 4 contact points at each leg for added rigidity. The optional Backrest is 6" High and 12" wide and adjusts up/down and forward/back. The adjustable height models feature chrome plated inserts and Tilt swivel glides. 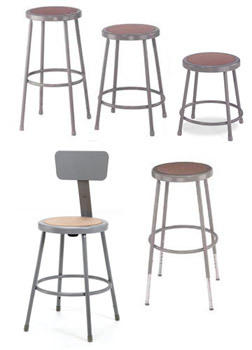 We suggest ordering 18"H stools to fit under standard table heights of 29"-30"H.
Stools 24"H and higher are designed for use with standing height tables of 36"H or taller. Call or use our Chat service for help or questions.